Knights of the Order of the Holy Sepulchre of Jerusalem have been present in Malta as early as the mid 18th century but they were not constituted as an official body existing simply on their own personal merit. In 1994 Chev. Louis Gera Lauron dei Marchesi Testaferrata, a member of the Order, embarked on a project to set up an official jurisdiction of the Order. With the assistance of the late Victor Licari, Vincent Attard, Marco J. Spiteri Binett, he embarked on this project which came to fruition through the intervention of His Excellency Mgr. Emmanuel Gerada, titular Archbishop of Nomentum, Apostolic Nuncio to Ireland and who retired and settled in Malta in 1995. The Lieutenancies of Ireland and Scotland contributed to the birth of the Maltese jurisdiction. The Magistral Delegation of Malta was installed by the Grand Master His Eminence Cardinal Caprio by decree of the 10th March 1996. On the 14th September 1996 the first investiture of the Magistral Delegation of Malta was held at the church of Holy Mary of Jesus in Valletta by His Eminence Carlo Cardinal Furno, Grand Master. On the 25th May 2000 the Magistral Delegation of Malta was elevated to a Lieutenancy by decree of His Eminence Carlo Cardinal Furno. The late Victor Licari, Knight of the Grand Cross who served as Lieutenant of Malta and later Lieutenant of Honor. 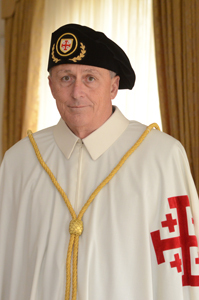 The late Eric Fenech Pace, Knight of the Grand Cross who served as the second Lieutenant of Malta between 2011 and 2018.